With the 2018 Update to the DUII Trial Notebook, editor Robert Crow and contributing writer Mary Sofia have included legislation from 2017 and new case law changes since the manual was released in March 2014 and previously updated in 2016. The 2018 updated chapters are: Chapter 1 – The Offense, Chapter 6 – Diversion, Chapter 7 – Pretrial Motions, Chapter 12 – MJOA / Mistrial, Chapter 15 – Jury Instructions, and chapter 16 – Sentencing. NOTE: When you purchase The DUII Trial Notebook hard copy or PDF it will include the 2018 Update. If you already own The DUII Trial Notebook, a PDF version of the 2018 Update is available at no charge.. Those who wish to purchase a 2018 Update hard copy for $29 may do select this option. 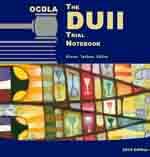 OCDLA thanks editor Robert Crow and contributor Mary Sofia for their efforts compiling this year's update to the DUII Trial Notebook. Electronic downloads are for members only with the exception of law libraries and are intended for the number of users indicated in the license. Members will need to log in to purchase downloads and get member discounts.